The content of this website provides interesting facts and information about American symbols, signs, icons and emblems of the 50 states of America. American symbols are important as they represent and convey the ideas, aspirations and beliefs of the country. The American Symbols and those of the 50 states of America take the form of words, such as songs, mottos and nicknames or visual images such as flags and emblems that instantly convey information and ideas. American symbols summarize and encapsulate the values and ideals of the people of America. They also convey a sense of history and achievements. Each of the 50 states have their own American symbols and symbolism. The different state symbols include emblems that are all highly significant to the flora and fauna of the state. State symbols and symbolism include animals, birds, fish, reptiles, trees, flowers and plants. Some also include gemstones and stars. 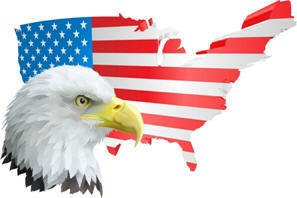 Check out the State Symbols section for details of all of the American State symbols and symbolism. The national motto of the United States of America is "E pluribus unum", which means 'Out of many, one'. This is a brilliant motto for America as it succinctly reflects the ideals of a country which began with the 13 original states and then, over just a short period of time, extended into the nation of 50 states. There are formal mottos and popular nicknames for all of the 50 states. These are American symbols that are highly descriptive of the people who live in the state together with the geography and the history of the state. The State Seals are also American symbols and they graphically complement the ideals and aspirations expressed in the State Mottos and are full of symbolism. The Flag of America, the Stars and Stripes, is immediately recognisable and is the most famous of all the American symbols. The American flag has 13 stripes that represent the 13 original colonies and it also displays 50 stars that represent the 50 states of America. Each of the 50 has its own home grown American symbols including a state flag. The American state flags convey many meanings and were chosen with great care - check out the section on State Flags for great pictures and images, history, symbolism, flag etiquette, sizes and dimensions, protocol, rules of display and disposal, flag poles, folding and the meaning of the folds and National Flag Day. American Symbols for kids provides additional facts and information about each of the states. There are sections relating to the State counties that also have maps. Information about all of the capitals of each of the states. Useful information about American State Abbreviations and State Initials. The American state cities and parks are also covered providing useful facts and information for people travelling or visiting these places. There are many Patriotic American symbols and famous landmarks that represent the USA. The Patriotic symbolism of the Stars and Stripes flag immediately comes to mind as does the bald eagle which is the national bird of America. 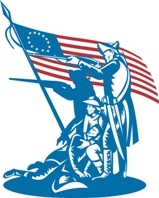 Other patriotic American symbols and famous landmarks include the Great Seal of the USA, the Statue of Liberty, the Washington Monument, the White House, the Lincoln Memorial, the US Capitol, the Liberty Bell, the Statue of Liberty, Mount Rushmore, Yankee Doodle, Uncle Sam, the National Mall and the Golden Gate Bridge. There are, of course, many other landmarks and patriotic American symbols, examples of American symbolism that we have also included in this section. The reference in the American song to the "land of the free and the home of the brave" are highly emotive and beautiful words that encapsulate the spirit of America. Each of the 50 states have their own state song. The lyrics of the songs are also emotive and are the types of American symbols that represent 'home' and pride in the place that they live. The lyrics of these songs, together with the mottos and nicknames of the states, begin to paint a vivid impression of each state together with their history, beliefs, achievements and their aspirations for the future. The United States Code is the official compilation of the general Federal laws which is compiled by the Office of the Law Revision Counsel of the United States House of Representatives. The Code is divided into 50 titles by subject matter and include the official United States National symbols in Title 36, Chapter 10. The official United States National symbols are the National flag, the Seal of the United States, the National motto, the American National anthem, the National bird, the National flower, the National Tree, the National March and the National Creed - the American's Creed. The National anthem: "The Star Spangled Banner"
National mottos: "E Pluribus Unum" "In God We Trust"
The National march: "The Stars and Stripes Forever"
Our website would not be complete without the most famous American Symbols - the United States Presidents. The fabulous, patriotic pictures of presidents on this page are just a sample of what you will find. The pictures of presidents are accompanied by a video containing interesting facts and information about each president, using the pictures of presidents we have featured on this website. The United States President pictures and videos are perfect for kids, children and schools learning about American symbols, emblems and icons. The pictures of the Presidents are a visual type of American symbols that symbolize not only the man but also the events and achievements of his era and the accomplishments of Americans and US history. Read about the character and personality traits of the men that led America to greatness. Test your knowledge of these famous American Symbols with our Name the Presidents Quiz.